Pursuit of Felicity: 24 while 24. 1. Expand my design business to include personalised invitations, business cards etc. 2. Make graphic and web design my full time job. 3. Be earning more than $700 per week by the end of January. 4. Move into a 3 bedroom house or apartment that allows pets, has air conditioning, modern appliances etc. 5. Buy a long haired English cream miniature dachshund puppy. 6. Spend more time with our "couple" friends. 7. Spend more time with my childhood best friend, Jamie, and her soon-to-be-born son. 8. Achieve my current dream body at the gym, i.e., the starting of a six pack, tighter thighs and flab free arms. 9. Continue to eat clean and stay away from alcohol. 10. Buy a new computer desk. 11. Buy a new, high quality, university style computer chair. 12. Buy a new, correctly colour calibrated, desktop computer. 13. Find the perfect chicken curry pie recipe. 14. Take B on a mini vacation when he finally gets some time off from working at the hospital. 15. 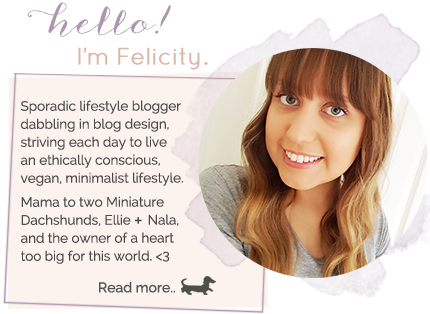 Reach 500 followers on bloglovin'. 16. Start making Youtube videos again. 17. Finally sell or give away the clothes that I no longer wear. 18. Grow my hair out to the top of my birthmark by my next birthday. 19. Buy a lottery ticket. 21. Buy a new car. 22. Get fully comprehensive car insurance. 23. Get engaged to B. 24. Create a '25 while 25' list. Wish me luck and I'll talk to you all again in a couple of weeks!